Indulge your feet in the shower or in the bath tub – with the waterproof Pedi perfect™ Wet & Dry, using roller heads specifically designed for use on both wet & dry feet. Now, there is no need for batteries anymore. Simply recharge the cordless device on your docking station. No matter what your skin is like – there is a speed that fits your needs. Choose between the gentle (low) and the intensive (high) speed and enjoy soft, beautiful feet after only one use. High control - Ergonomic design for comfortable handling and easy reach. has never been so flexible before. 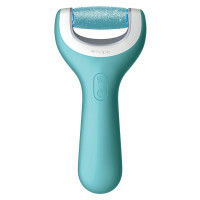 Watch our Amopé Pedi perfect™ Wet & Dry Rechargeable Foot File in action! 1. Treat yourself to natural-looking and shiny nails. Soft, beautiful feet go nicely with shiny nails! Now you can easily do your fingernails and toenails with the Amopé Pedi perfect™ Electronic Nail Care System. As the proud owner of the AmopéPedi perfect™ Wet & Dry, you'll be asked lots of questions. If you want to know all the answers, just check out our FAQs. Is the Wet & Dry unit completely waterproof? Which speed setting should I use? New special coarse roller heads for wet & dry use! smooth feet and naturally shiny nails. Give your feet and nails every care they need with products from our foot care range.